Aural feedback is a funny thing: it can be a nightmare or provide an interesting effect to a performance. Bad: a mic turned up too loud at a pulpit, or high school assembly, or by the inexperienced sound man at your gig; it is a brief ear (drum) piercing shock that causes gasps and cannot be ignored. On the other hand, a guitarist manipulating a cool overtone cloud by leaning on an amp is as satisfying as a purring cat. 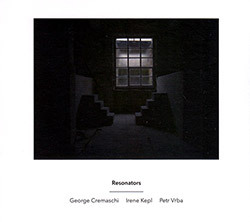 George Cremaschi (bass and electronics), Irene Kepl (violin and electronics) and Petr Vrba (clarinet and electronics) creatively work in the latter realm, except the "amp" that provides an amplified controlled chaos comes from the acoustics in monasteries and palatial halls. "Affective Labor" is the group's Frankenstein gradually (!) coming to life and taking first steps (or mythical sea monster awakening and heading for shore, or a cell experiencing mitosis). The occasional deep-note pluck by Cremaschi is surrounded by wispy warbles and flickering-but-muted soundwaves. This texture swells and builds and gives way to lower frequency rumbles, and Kepl playing the first "notes," which consist of brief pizzicato bursts, sporadic glissandi and delicate single-string accelerando / decelerando. As far as the resonance surrounding the trio (much of it hand-coaxed in real-time), Cremaschi has mentioned that the performance spaces become "a sort of additional member" during the works. This becomes evident near the 9:30 mark where, with the aid of the players, this "member" overtakes the acoustic instruments in a frenzy of snarls and howls. The thirteen-minute "Locus Resonatus" begins with a temperate clarinet solo from Vrba that evokes the somber nature of Messiaen's Abime Des Oiseaux (third movement of Quatuor pour la fin du temps). Soon the lines begin to double and loop, phasing and woozy when unison, spider-like and expansive when contrapuntal. Vrba and Cremaschi join to muster a slowly beating cluster � one that sounds much bigger than something spawned by only three people � that almost comes into harmonic focus at various points throughout. But that would be boring. Instead, the band continues to introduce more and more elements to revel in a lovely so-called dissonance. The relatively aggressive finale, "Pirol," is largely absent of the electronic influence heard on the previous set. Instead, Cremaschi taps, pounds, and furiously bows, Kepl plays a virtuosic flurry of bursts, and Vrba spends time switching between boisterous exhaled breaths and dynamic trumpet surges. The group works interdependently without following many cues from one another, but at times hands each other the baton. And after one mammoth string snap, they're done.